With online bookmaker sites becoming increasingly popular worldwide, more deposit options continue to emerge that not all players may be familiar with. One of these methods is UnionPay, a Chinese bankcard that’s accepted in over 150 countries and regions worldwide. If you’ve spent some time placing bets online, you’ve probably seen this logo pop up from time to time. Many bookies are recognising the dominance of UnionPay as a choice for Chinese players and you’ll now find this option at a selection of reputable Asian online bookmakers. 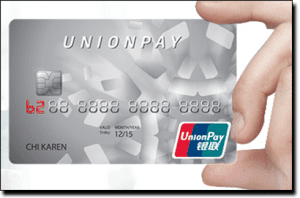 UnionPay (sometimes called China UnionPay or abbreviated to CUP) is a Chinese bank card association that was established in 2002 and has quickly established itself as one of the country’s leading bank card brands. UnionPay was established under the approval of the State Council and the People’s Bank of China. The first UnionPay product was a domestic bank card that could work on an interbank network, the first of its kind in China, linking ATMs from all banks across the country (excluding Hong Kong and Macau). 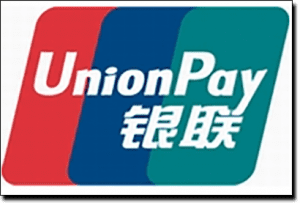 Given the huge success of the UnionPay bank card, the brand has since expanded hugely and now incorporates UnionPay International, a card accepted at ATMs and EFTPOS machines in over 150 countries. Other China UnionPay products include the UnionPay Premium Credit Card, UnionPay Prepaid Card and UnionPay Commercial Card. In terms of the volume of transactions processed, UnionPay is second only to Visa as the largest global payment network. If you have a UnionPay card, we recommend Bodog88.com for safe, reputable sports betting. Follow our links to sign up for an account at Bodog88 and take advantage of special deals and bonuses. Complete the deposit and your funds will typically be available to use instantly, so you’re now ready to place bets. Yes, UnionPay is one of China’s most trusted payment methods, with the largest payment network in mainland China and with a range of services including credit card and prepaid cards there is a payment type to suit all players. Given the dominance of this brand, UnionPay follows incredibly strict security measures, supporting anti-theft, anti-fraud and anti-money laundering provisions. The brand is fully supported by a backend team available to support customers 24/7. UnionPay has partnership with other trustworthy global brands such as American Express, Citibank, NAB, Travelex, AT&T, ANZ and HSBC. Our recommended bookmaker sites all use a minimum of 128 Bit SSL security encryption to protect all player information, so coupled with UnionPay’s high reputation and security backing, UnionPay provides a safe option for depositing at bookmaker sites. Is UnionPay accepted outside of China? UnionPay is accepted at ATMs and EFTPOS machines at over 150 countries, including Australia, USA, New Zealand, Canada, the UK and many parts of Europe like Germany, Spain, France, Italy, Portugal and more. UnionPay cards allow the user to withdraw funds in the local currency, in the same manner of global travel cards like Amex GlobalTravel Card or Cash Passport, anywhere the UnionPay logo is displayed. For Chinese customers, this makes UnionPay incredibly useful as funds can be accessed worldwide using the same card you use at home, with low transaction fees. For people residing outside of China, there isn’t much use of a UnionPay card as all funds on UnionPay are in RMB (¥). While UnionPay provides a great, safe payment option for Chinese players at online bookmakers accepting this payment method, it won’t be of use to punters from other countries. Most Australian and UK owned bookies like WilliamHill, Sportsbet, CrownBet and Bet365 don’t offer UnionPay as a deposit method. Want to start placing bets using your UnionPay card? Click our links to sign up at Bodog88, take advantage of special deals and start betting on basketball, tennis, soccer, football, racing and much more.